Rule number one of our official Submission Policy is that you may not submit anything to your FAC gallery which is owned or copyrighted to someone else. One specific type of copyrighted content is the use of website-based "kits", "generators", or "dollmakers" which allow you to composite a variety of premade graphics together to assemble a customized character. Artwork created through the use of "kits" or "generators" is protected by the original owner's copyright and NOT acceptable for submitting to FAC. GaiaOnline avatars can be immediately recognized by their characteristic pose, shown above. Only registered GaiaOnline.com members have access to the official generator (used to manage their GaiaOnline.com user avatar), and while there are a number of "unofficial" generators, all graphics are copyrighted by GaiaOnline.com and we do not allow GaiaOnline avvies to be submitted here if they were created using a generator. This does not mean you can't submit fanart of a Gaia avatar -- this is only saying you can't use the generators to do it. We do have a submission category for Gaia Online fanart and Gaia avatars which you drew yourself. Avvies made using the "South Park Studio" generator can be easily recognized by their uniform body shape and flat colors. 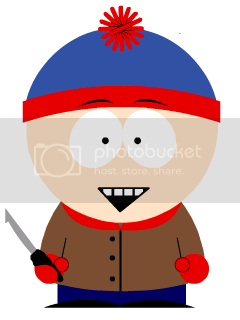 The "South Park Studio" generator is itself a fan project based on the South Park series, the graphics used in the generator were created by a fan and are protected by copyright. Finally, please note that pixelart bases are not the same thing as a 'kit' or 'generator', we have different rules for dealing with that.